There is a science called ‘quantum physics’. This science teaches that in the microcosm the object under observation definitely experiences the observer’s thoughts or that the result of the experiment depends on a scientist. For us who made their decision to practice martial arts this is essential. Microcosm is a world of elementary particles and waves. The world of waves equals the world of Ki (life energy). With the naked eye we perceive objects by means of light; however, the fact that these objects depending on the light can be greatly distorted has been already proved in physics. Whether we see by means of light only or perceive by touching with our fingers –this makes all of us significantly different from each other. That means that the world in which we decided: “It must be like this”, is a world created by ourselves, the world which each of us has identified by himself by seeing, feeling, hearing. Two worlds which are the same do not exist. So that is the essence. When a child sees his mother, hugs her, talks to her, this is a woman-mother in front of him who gets the energy of this child’s thoughts. When a child’s father sees his wife, hugs her and talks to her, this is a woman-wife in front of him who gets the energy of her husband’s thoughts. That is why if a child and his father have an argument about the child’s mother, they will never come to an agreement. The only thing that is true is that “a man exists as a living soul”. Now let’s come back to aikido: in 1971 I was a member of Aikikai. 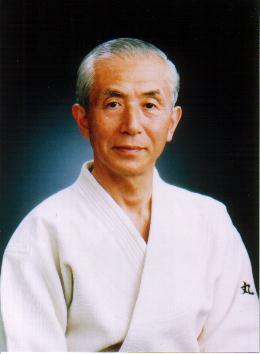 According to the instruction given by my teacher Tohei Koichi I was sent to Hawaii as a deputy of Sensei. In 1952 in Hawaii Tohei Sensei introduced aikido for the first time and since then all students got accustomed to Sensei. And there I came, a young man, completely unknown, which of course aroused everybody’s protest. Later on I got to know that those who already had got their levels agreed behind me not to do ukemi in any way. On the first day of classes, though I do not already remember, they say we practiced usirotori kokyunage. The first person grabbed my body from behind. I thought that he had pressed too hard but I was sure that he would certainly do ukemi. Turning slightly my hips I made the throw easily. The next one grabbed me strongly and I made the throw smiling. And then I threw one more person and again and again, perhaps 5 or 6 people more. It was in Honolulu Dojo. They say that after that at the same day the instruction: “This is a true teacher! Everybody should listen to what Maruyama Sensei says!” was spread all over the dojos on the islands of Oahu, Maui, Hawaii, Kauai. When the other day I read the definition of quantum physics I thought: “So that’s what it is!” Then in Hawaii I had no doubts that my partners would do ukemi. Those thoughts were transmitted to them and by intuition they did ukemi nevertheless. Once a well-known samurai Miyamoto Musashi, called God of Sword, fought 60 duels and defeated all of them. I think he defeated because he believed: “I’ll defeat”, he had no doubts and “ki” (waves) was transmitted to his opponents. And Musashi was not the only one. The founder of Shinkage-ryu, a school of swordmanship, Kamiizumi Nobutsuna. The famous swordman from Kashima-Shinryu school Tsukahara Bokuden. A lot of other swordmen who practiced hard also gained firm confidence in their victory, so that attitude of mind was transmitted to their opponents. Based on this experience whatever country I would go to I always make my mind: “My partner will do ukemi”. It is not me who makes the throw. It is my partner who tunes in to the wave of my thinking (ki) does ukemi. This is a true “spirit of aiki” and “love”. Ueshiba Sensei who stated that “Aikido is love” once told me that when he faced his partner he already saw him doing ukemi. In the Bible Jesus Christ said: “He who believes will be saved”. If little by little but faithfully one moves forward on his way in which he believes, without looking back and with a sincere heart, persistently, without falling into illusions or trivial thoughts, then ahead a bright future will certainly open up.